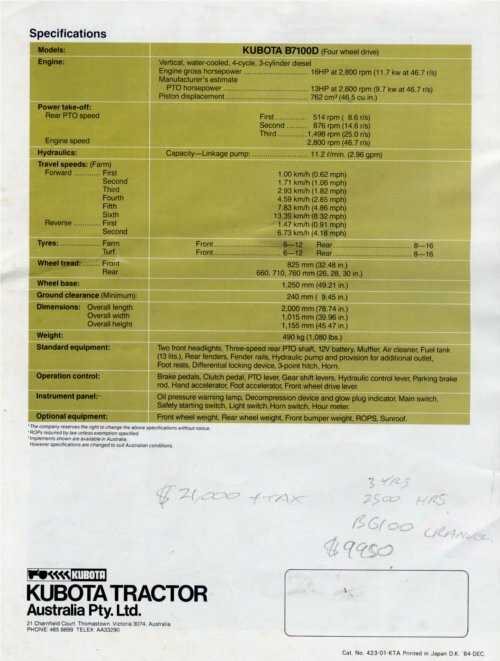 An OrangeTractorTalks reader going by the name gazza recently posted in our gallery an Australian Kubota B7100D brochure originally printed in 1984. The brochure is in excellent condition and considering how many folks own a B7100, it is definitely worth sharing on the main stage here. Click the images for the full sized pages. 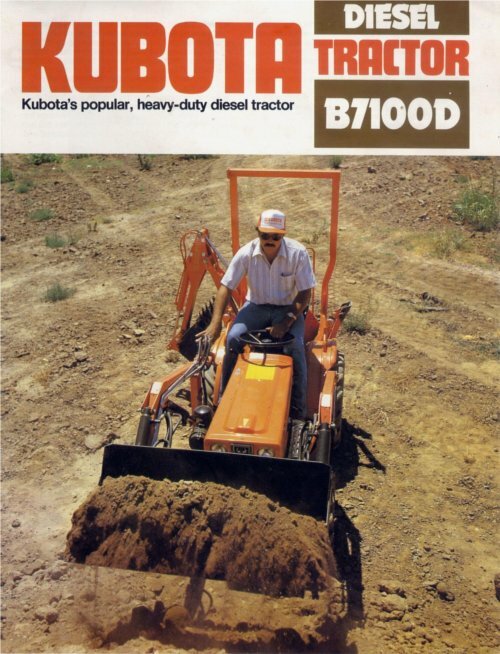 Kubota is correct in stating that the B7100 lineup was a popular model. Kubota manufactured several variants of the B7100, like the B7100D (4WD) but also a B7100E (2WD) and B7100HST-D and B7100HST-E (hydrostatic 4WD and 2WD models). It is commonly owned and replacement parts, Kubota or aftermarket, are easy to find. Related Kubota models are the smallest B5100 and mid-sized B6100 which share many of the same components, general appearance and some attachments like mowers and backhoes. Horsepower ratings range from 12, 14 or 16 horsepower (13 at the PTO) for the B7100 shown. The business-end of this B7100 is the optional B670 backhoe – a pretty rare find but they do exist. We also get a peek at the tractor equipped with the optional turf tires and finish mower. In Japan, the B7100 would more likely be found in a rice paddy than a farm, acreage or golf course. Japanese Domestic Market (JDM) B7100s instead came equipped with a rototiller and 32 ’tiller tines. Notable here is the presence of both a front and rear PTO which means the B7100 can be used to power a snowblower or front-mount mower. We dug up a forum posting on TractorByNet entitled Front PTO Shaft Impossible to Find that details one owner’s trials with the 22-spline front PTO shaft stripping out. The front shaft is apparently highly susceptible to failure on the B51/61/7100 models. On the specifications page we see what looks to be the original dealer quote for a B7100D: “$21,000 + tax”. At $21,000 1984 dollars, or almost $10,000 for a 3-year old B6100 with 2500 hours, Kubota was not exactly giving these away in Australia. We have our very own B7100 specifications page which includes detailed specifications, photos uploaded by other owners as well as related videos. Check it out! 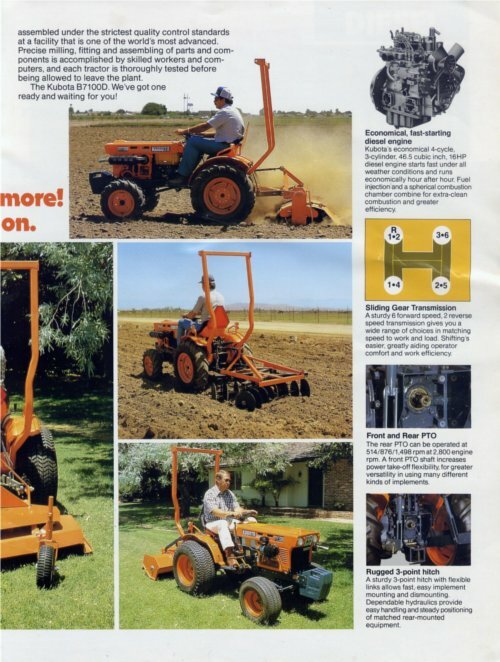 Special thanks to gazza for posting a great vintage Kubota brochure for the rest of us to look at! 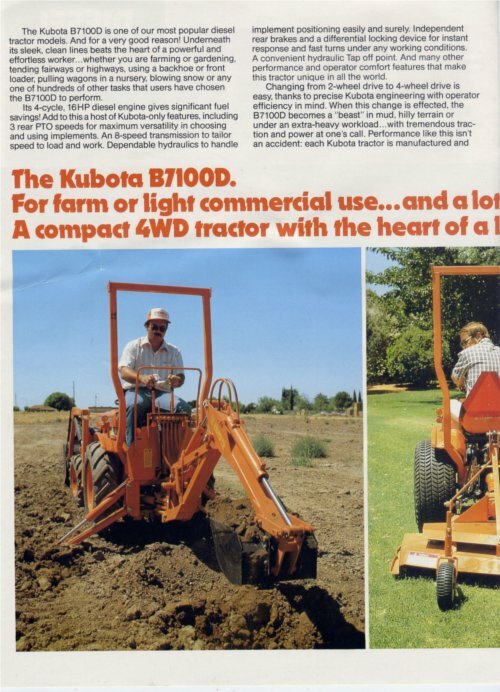 If you have a brochure or vintage Kubota literature you would like to share, please email Mr. K at mrk@orangetractortalks.com. We would be most pleased to see what you have. Mr. K you are right on. I have been searching for a 22 spline 18mm front pto shaft for my b6100 and it is next to impossible to find. So I am still looking for other ideas.